It’s been a whirlwind of a semester already and things aren’t even close to slowing down in the DLT. We’ve added 400 more sites to OU Create, assisted in the Canvas implementation to the tune of 35% adoption, and have also been fortunate enough to give the Norman VIP treatment to a couple of people within our edtech kin. A week ago, we had Matt Crosslin from the UT-Arlington LINK Reseach LAB come up to chat about OU Create. UT-Arlington is thinking differently about domains and the classroom with a specific slant on research. As Alan Levine recently mentioned, there is little-to-no research being done specifically on projects like DS106/DoOO, which doesn’t actually surprise me at all. Throughout my time working within domains I’ve received multiple requests to discuss implementation of domains but very few on research. For Matt, the team was able to pass along some of our strategies for onboarding students, how we’ve thought about how domains and LMSs can work together (this is partially due to Matt’s particular interest in dual-layer/customizable pathways as well as our recent Canvas transition), how domains have provided soft infrastructure for digital humanities projects like the New Deal in Oklahoma project, and also showed off some of the new virtual reality projects that are being championed through OU Libraries thanks to Sarah Clayton. And THEN we had this by-no-means long-term impactful football game against No. 3 ranked THE Ohio State Buckeyes over the weekend. Back in April at OLC Innovate, on the New Orleans streets o’ Bourbon, I promised Ben Scragg a free room if he ventured down to Norman for the football game. He took me up on that offer and stayed in our guestroom for a few nights. He also spent two full days getting to understand the in’s and out’s of CTE and got more than his money’s worth of Oklahoma culture and cuisine. I’ll get into our professional discussions further down, but let me first say how fun it was to get to spend time with Ben on a pure, dad level given that we are both fathers to tiny ladies. Ben’s kid is currently much younger than either of ours, but she has a lot to look forward too. My two daughters thought “Mr. Ben” was the cat’s meow to the point where my oldest opened up my camera app to and ask Mr. Ben to take a selfie. She also reads two books from school every night (this is because you are only allowed to check out two books at a time and she wants new books every day) and when I asked her who she wanted to read with her she requested the bearded child whisperer. Other than his asute ability to explain Dr. Seuss’ nonsensical words to a four year old, it was also great to spend time with someone from an aspirational univerisity for us. Ben and I first met in 2014 at a time when many people were telling me to look at tOSU as a university that was similar in stature to OU, so I’ve followed the ODEE ever since. There is a culture of complexity of institutions our size, so I really appreciate when I can hear from someone that we share a similar feeling of institutional-ness. 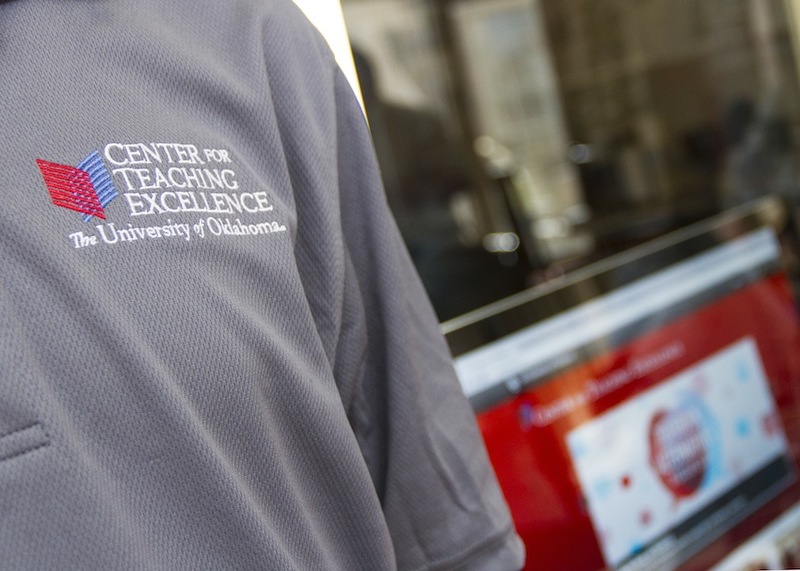 Similar to Matt’s visit, we talked a lot about OU Create with a particular emphasis of how OU Create has powered the curriculum for several (1, 2, 3, 4, 5, 6) faculty learning communities which allows anybody to peer into our FLC structures. Ben even got to sit in one of Keegan’s sessions of eXperience Play, the newest brain child of the dynamic duo of Keegan and John Stewart, which requires faculty to create text-based games by the end of the sixth session. Anybody who knows Keegan knows that his enthusiasm for technology, teaching, and learning is infectious, to a point in which he’s built a small following of Keeganers. We also talked about the Creaties. I mentioned how I hoped the Creaties brought aspiration to OU Create users by supplying a batch of best in class while also rewarding those who have worked hard in supporting our mission. It was exciting to hear how tOSU has both faculty and student showcases happen once a year through Innovate 365. Similar to OU, tOSU is current in between transitions of D2L and Canvas and this is their first full semester. This week their showcase is showing Canvas courses that are works-in-progress and gives space for faculty to talk about what they like, what they don’t like, where they found themselves stuck, and how they’ve worked through/around it. Needless to say, it’s been great having a recent wave of visitors find their way to the middle of the country to visit campus. I’m proud of the team we built and more proud that we get to show it off in conjunction to learning from people in similar positions. If you would have told me anybody from tOSU or a UT system school ever wanted to come visit, I would imagine the only scenario would be that they were trying to collect on a poor football game bet I had made somewhere along the way. It turns out tOSU are not that kind though as multiple tOSU fans have penned letters to editor thanking for the Oklahoma hospitality. With all of that said, please reach out if anybody else wants to do stop by rather than doing the usual flyover method of seeing Oklahoma. I love visitors! Visitors are my favorite!